Allow us to list your home for a quick sale. As real estate specialists, we know what it takes to sell your home. We bring expert knowledge, valuable experience blended with the latest technology, a well-defined marketing plan, a cohesive network, energy, enthusiasm and the excitement of a job well done. We know the area and the home values, and we know how to help you get the most for your home. Pricing a home for sale is as much art as science, but there are a few truisms that never change. Fair market value is what a willing buyer and a willing seller agree by contract is a fair price for the home. Values can be impacted by a wide range of reasons but the two largest are location and condition. Generally, fair market value can be determined by comparables – other similar homes that have sold or are currently for sale in the same area. Sellers often view their homes as special which tempts them to put a higher price on the home, believing they can always come down later, but that’s a serious mistake. Overpricing prevents the very buyers who are eligible to buy the home from ever seeing it. 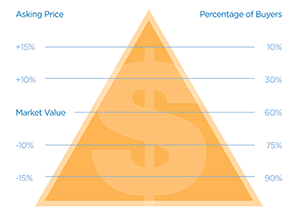 Most buyers shop by price range, and look for the best value in that range. With a sign in the yard, a description in the local Multiple Listing Service, distribution across the Internet, open houses, broker’s caravan, ads, and email blasts to your listing agent’s buyers, your home will get the greatest flurry of attention and interest in the first two weeks. If you don’t get many showings or offers, you’ve probably overpriced your home, and it’s not comparing well to the competition. Since you can’t change the location, you’ll have to improve the home’s condition or lower the price. Consult with your agent and ask for feedback. Perhaps you can do a little more to spruce up your home’s curb appeal, or perhaps stage the interior to better advantage. The market can always change its mind and give your home another chance, but by then you’ve lost precious time and perhaps allowed a stigma to cloud your home’s value. Intelligent pricing isn’t about getting the most for your home – it’s about getting your home sold quickly at fair market value. In a neighborhood of similar homes, why is one worth more than another? That’s the question that’s teased buyers and sellers for ages, but the answer is simple: Every home is different. Location – The closer a home is to jobs, parks, transportation, schools, and community services, the more desirable it is. Curb appeal – From the street, the home looks clean, fresh, and inviting. Fresh landscaping and flowers won’t change the size or location, but they certainly add charm. When two homes are identical in the same neighborhood, a higher price may come to down to something as simple as views, or paint colors, or the overall taste of the homeowner. Are Those Online Home Value Sites Accurate? Plenty of sellers have visited online home valuation sites such as Zillow, Trulia, eAppraisal, and others, only to be shocked at the value of their homes. Estimating a home’s market value is far from an exact science. What these sites attempt to do is provide greater transparency to homebuyers and sellers by making data derived from public records, more…public. They publish what you paid for your home and how much you pay in taxes. Many have satellite views so accurate they can spot your cat laying on the front porch. How do they do it? Home valuation sites contract with major title companies such as First American to obtain county tax roll data. All property is registered with the county for property taxing purposes. They also find ways to become members of local multiple listing services, which are either subsidiaries of real estate associations or owned by local real estate brokers. That way, they have access to listing data. Sometimes the results are spot on, but they can also be terribly inaccurate. First, transaction data has to be recorded with the county, which could take weeks. But, what alters the algorithm most is that properties not currently on the market are included in the data. The algorithms can’t possibly show whether or not a home has been updated, how well it’s maintained, or esoteric values such as curb appeal and views. For that reason, online valuations should be used only as one of many tools to estimate a home’s value. What Is Curb Appeal And How Do I Improve It? Most buyers form their first impression of your home before they even get out of their cars. This is “curb appeal,” or the view from the curb that tells the buyer how attractive and well-maintained your home is compared to other homes. In a competitive market, it takes more than trimming the hedges and planting a few flowers to create curb appeal. The exterior of your home must be in pristine condition – freshly painted, cleared of clutter, with no visible repairs needed. A broken step, overgrown bush, or abandoned toys in the yard can spoil the appearance and your buyer’s first impression. Curb appeal is important because it sets the tone for what the buyer is going to see inside. If the buyer likes the exterior, he or she will be predisposed to also like the interior and you’re that much closer to selling your home. To see what needs to be done to sell your home faster and for a higher price, go outside, stand on the curb and try to look at your home the way the buyer will. What do you see? Pay close attention to walkways, exterior features, the entry and landscaping. Entry – Power wash siding, brick, windows, and porches. Paint or replace furniture such as rocking chairs or porch swings. Replace mailboxes, light fixtures, door knobs or any other fixture that looks less than fresh. Put out a welcoming new floor mat. Some parts of your home may require more work than others, but it’s well worth it to get buyers eager to see what’s inside. What Should I Do To Make My Home Show Well? Eliminate clutter – Not only is clutter unattractive, it’s time-consuming to sort through and expensive for you to move. If you have a lot of stuff, collections, and family mementos, you would be better off renting a small storage unit for a few months. Keep, donate, throw away – Go through your belongings and put them into one of these three baskets. You’ll receive more in tax benefits for your donations than pennies on the dollar at a garage sale. It’s faster, more efficient and you’ll help more people. Remove temptations – Take valuable jewelry and collectibles to a safety deposit box, a safe, or store them in a secure location. Remove breakables – Figurines, china, crystal and other breakables should be packed and put away in the garage or storage. Be hospitable – You want your home to look like a home. Stage it to show the possibilities, perhaps set the table, or put a throw on the chair by the fireplace with a bookmarked book on the table. Have a family plan of action – Sometimes showings aren’t convenient. You can always refuse a showing, but do you really want to? If you have a showing with little notice, get the family engaged. Everyone has a basket and picks up glasses, plates, newspapers, or anything left lying about. Get in the habit – Wash dishes immediately after meals. Clean off counter tops. Make beds in the morning. Keep pet toys and beds washed and smelling fresh. Clean out the garage and attic – Buyers want to see what kind of storage there is. Five-minute clean-up – Everyone gets their baskets and cleans up clutter. Check for hazards, like toys left on the floor. Make sure toys, bicycles are put away. Put pets in daycare, sleep cages or take them with you – In the listing instructions, there should be a warning if there is a big dog on premises. Buyers with allergies also may appreciate knowing in advance if you have pets. Turn on lights – Open the drapes, turn on lights so buyers can really see. Give the buyer privacy – The buyer can not come to your home without being accompanied by an agent. The buyer can assess your home more honestly without your presence. What Features Help A House To Sell? According to the National Association of REALTORS® latest profile of homebuyers and sellers, buyers plan to occupy their homes for the next 10 years. They want homes that offer the room, flexibility and comfort they anticipate they will need for a long time. Over three out of four buyers chose a detached home, while attached homes–condos and townhomes–were favored by single homebuyers and buyers without children. The median-sized existing home purchased in 2010 was built in 1990, with 1,780 square feet, three bedrooms and two bathrooms. Size mattered most, while the home’s condition came in a close second. Buyers in multiple surveys expressed concerns over operating costs. They want energy-efficient appliances, windows, water and operating systems. They’re also carefully considered commuting costs to jobs, schools and other destinations. Overall, they’re buying smaller homes closer to the inner city. A study by The National Association of Home Builders found that buyers are interested in saving on square footage, but they want a gracious, but casual ambiance. It’s likely that new homes by 2015 will reflect buyers’ preferences for maximizing square footage with smaller entries, dining rooms and living rooms, and awarding that square footage to a greater-sized family room and eat-in kitchen. Out of favor with homebuyers are McMansion luxuries such as four bedrooms or more, three-car garages, butler’s pantries, two-story foyers and multiple shower heads in the master shower. Buyers want homes that are sustainable and affordable, more than homes that are impressive to others. For that reason, builders predict that homes of the future will continue to be smaller and more energy-efficient, with far better space-planning, storage and utility than existing homes have today. 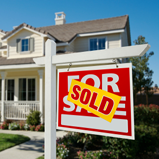 What Are Some Tips For Selling A Home In A Tough Market? When home prices fall, supplies of homes for sale increase, and buyers become more demanding, it’s a buyer’s market. That doesn’t mean you can’t sell your home for a fair price. You just have to work harder to make it happen. Show pride of ownership by putting your home in top move-in condition so that your home is more appealing to buyers than any other home in your price range. You can expect lowball offers in a buyer’s market, but homes that are priced fairly and in pristine condition will be treated with more respect by buyers. Pricing according to recent sold comparables might not be as smart as pricing to pending sales (those yet to close). You have to know what your bottom line is, but pricing your home should have nothing to do with how much you owe creditors, how much cash you need to buy your next home or how much you need for your retirement or any other reason. Buyers will only pay current or pending market value as determined by the most recent comparables. Negotiation is a fine art, and typically works best when both parties get what they want. For example, you may be willing to take less money in exchange for a cash offer or a quicker closing. Your buyer may be willing to pay your asking price, but they may ask you to pay their closing costs. You’ll quickly realize if you’re dealing with a sincere buyer. Respond to the buyer’s negotiations with documentation, receipts and other information in a timely manner. If you feel the buyer isn’t negotiating in good faith, simply stop negotiations. You’re under no obligation to respond to an unreasonable offer. The buyer will get the message. 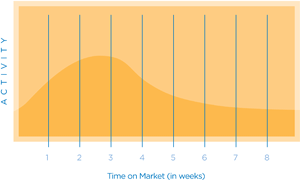 Buyer’s markets work for sellers, too. Keep in mind that when you buy your next home, you’ll be able to take advantage of falling prices, too. Think about the future – that you can repurchase more home for less money next time. It all evens out. Many sellers are finding that their homes cannot be sold for enough to cover the mortgage lien on their properties. So they sell “short” by getting the mortgage lender to accept less than what they owe to clear the mortgage debt. Why would lenders allow a short sale? Distressed home sales recently accounted for more than one-third of home sales, according to the National Association of REALTORS®. Lenders are already inundated with inventory that is expensive for them to maintain. They want to sell loans, not manage property. Has the home’s market value dropped below what you currently owe on your mortgage, according to recent comparable homes sold in your area? Are your payments current? Current payments may not rule out a short sale if other factors are leading to foreclosure. Can you show distress? Unemployment, bankruptcy, death or divorce are all hardships the lender will consider. Do you have a buyer? Prepare a Net Sheet that shows the sale price you will receive, costs of the sale, unpaid loan balances, outstanding payments and late fees. Do you qualify for the Making Home Affordable government refinancing or loan modification program? If you purchased your home before January 1, 2009, and are having trouble making your payments, you could be eligible for modification of your loan’s terms. Contact your lender and ask to speak to a decision maker who is authorized to approve your short sale. Provide a statement letter detailing your circumstances such as loss of job, medical problems, or whatever has caused your financial distress. Be willing to supply proof of assets, including recent bank statements, savings accounts, money market accounts, and anything else of tangible value. The lender may want to go back six months or a year to see your credit history. Show the lender your buyer’s purchase offer along with a comparative market analysis from your listing agent. The key to a successful short sale is to get started on a solution early. Contact your lender for help, before you get behind on your mortgage payments. We Have An Offer. What Do I Need To Know? Before you begin negotiations with any buyer, make sure you have the upper hand by removing any sticking points in advance. Price your home to sell at or below current market comparables and you’ll more likely receive serious offers close to your asking price. Put your home in spotless move-in condition, with no visible repairs needed. De-clutter your home, deep clean it, paint it and repair it, and keep it “show-ready” every day it’s on the market. Get your home inspected so you know where issues are and can correct them before they become negotiating points that cost you money. Buyers respond well to fair pricing and a “model home” appearance. Your buyer has less to negotiate, and will more likely make an offer closer to asking price. Buyers sometimes test sellers with low offers, but don’t get upset or discouraged. If the offer is too low, simply have your agent return the offer with a copy of recent comparables to show that your home is priced fairly at current market value. They will get the message, and either come back with a reasonable offer, or move on to another home. If the offer is low, but close to what you want, study the terms carefully, adding up possible expenses such as paying the buyer’s closing costs. Before you agree, make sure the buyer is pre-approved with a lender and working with a real estate professional. Serious buyers have access to the same comparables as you do, so a buyer working with a real estate professional is more likely to be pre-approved by a lender and informed of current market conditions. A full price offer doesn’t mean negotiations are over. It could signal that the buyer intends to negotiate a lot of repairs or refurbishing costs during the inspection period. Stay calm and reasonable. If you’ve done your homework–priced and prepared your home for the highest, best offer, your home will sell at a fair price. The House Is Sold And It's Time To Move. Any Advice?